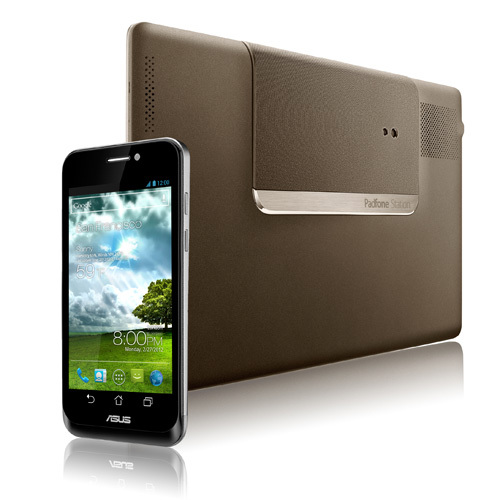 Asus Padfone in general is a phone, but the great thing about it is that with the help of the so called Padfone station you can turn it to a tablet and then turn the tablet into a fully functional notebook. sus Padfone in general is a phone, but the great thing about it is that with the help of the so called Padfone station you can turn it to a tablet and then turn the tablet into a fully functional notebook. The elegant design is not so surprising considering the resemblance with the ZENBOOK – metallic finishes and tapered edges. The phone’s shape and size allow you to use it easily with one hand, despite its 4,3 inch capacitive multi touch screen Super AMOLED display. It has a scratch resistant Gorilla glass and what’s good about is that it’s really responsive, the viewing angle is wide enough and its viewable in direct sunlight. It has a scratch resistant Gorilla glass and what’s good about is that it’s really responsive, the viewing angle is wide enough and its viewable in direct sunlight. At the periphery we find the volume buttons, a micro-HDMI and micro-USB ports and a 3.5 mm audio jack plus the power button located at the top. The phone weights 129 g and its dimensions are the following : 128 hight , 65.4 width and a thickness of 9.2 mm. Thanks to the DynamicDisplay technology, as soon as you place the PadFone into the PadStation it automatically adjusts the display layout and just like that you have a bigger screen. Its also intelligent, remembering where you stopped whatever you were doing so you don’t have to start all over again with every switch. The Padstation’s cannot operate by itself and has a 10.1 inches wide display. The Padstation’s cannot operate by itself and has a 10.1 inches wide display. There were no issues with the smartphone’s performance, it doesn’t lag even when connected to the station. It runs with Android 4.0 with some useful software additions. Never heard of a phone that could operate for up to 63 hours per charge – with the PadFone iserted in the PadStation this is possible thanks to the stations built in battery. And if you’re wondering how many insertions and removals the PadFone can withstand – according to lab test results – a minimum of 5000. On the rear panel we find the 8 MP camera and the back-illuminated CMOS sensor.The card slot allows you to increace the memory space with up to 32 GB + there are 32 GB free cloud storage. The processor is a dual core 4th generation Snapdragon S4 at 1,5 GHZ You could purchase optionally a dock which allows you to add to the picture a detachable keyboard and turn everything into a notebook much in the Transformer pad series.